I have normal to oily skin- more on the oily side in the summer months though, as a result I have experimented with many different powder products over the past 10 or so years. I have ranged from loose powders to pressed- talc free to who knows what. I was introduced to MAC mineralize foundations about 3 or four years ago (time times get hazy the older you get). I was at the store to try new things that day so I decided to take a cleansing cloth and remove my makeup and try on some mineral foundation. The makeup artist and I swatched through a few liquid mineral shades until she found one she thought was great- I had my reservations- but I let her slather is and rub it into my face. Let’s just say when I looked into the mirror I thought I looked like an umpa lumpa – ORANGE/RED!!! I remember we tried two more shades and I still did not quite like the color, on top of it all it seemed to streak on my skin! After that I decided that I didn’t like mineral makeup!…period! !…..until recently. I was tired of my MAC blot powder that I had settled with for the last two years as my finishing powder over my liquid foundation and I wondered, as usual, into my MAC store to look for something new to try. I was finding in the summer that the blot powder left a bit of a grey – talc- look on my sun kissed skin and I wanted something with rich pigment. The makeup artist suggested Mineralize Skinfinish Natural, at first I declined but then I came around to it after she told me she was wearing it. Her skin looked beautiful, so I chose my color- Medium Deep- and took the plunge. The next day I incorporated it into my makeup routine and LOVED it. The finish was delicate and even, the powder looked so very natural and it was comfortable on my skin. 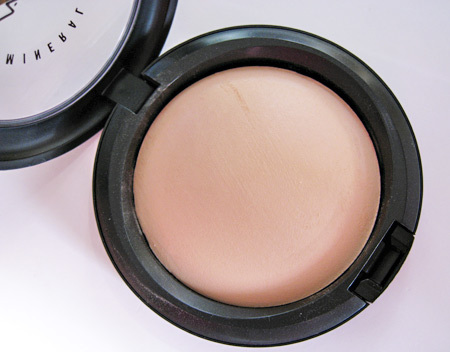 I was able to blend my non mineral blushes on it easily and my skin was glowing- but talc looking at all! I have been using the Mineralize Skinifinish Natural for 4 months now and I have no complaints about it at all. The summer has really started to kick in and the powder holds up with no streaking discolouring from oil or anything strange. Mid day I usually use a oil blot paper and remove oils and swipe a new coat of the mineral powder on to look fresh for the afternoon. The powder hasn’t made my skin or eyes itch and it hasn’t made me break out. I give this product an unexpected thumbs up all around and at this point it is my all time favorite finishing powder! I would recommend this MAC product to anyone who uses powder over their liquid or cream foundation. It is a great finishing product – I would not suggest that you use this porduct as your only face coverage. My only con that I have with Mineralize Skin Finish powders is that they all do seem to lean into the orange range once you get into the darker shades. But if you use it to dust on to finish your look you shouldn’t really even notice.